We have just looked at three politicians of the late nineteenth century and another one is involved in today's post. Sir Charles Lilley achieved an awful lot during his life. He was a soldier, a journalist, a newspaper editor, a lawyer, a politician, colonial secretary of Queensland, attorney-general, premier, judge and chief justice. Whew! There was a notable number of firsts involved - he was the first solicitor admitted to practice at the Supreme Court at Moreton Bay, he was a member of the first Legislative Assembly of Queensland, and after becoming a barrister he was the first Queen's Counsel in the colony of Queensland. He is also largely credited with the provision of free education in government schools and he was knighted in 1881. Charles Lilley was born in 1827 in England and found himself in Moreton Bay in 1856, working as an articled clerk to solicitor Robert Little. He married Sarah Jane Jeays in 1858 - she was the daughter of prominent builder Joshua Jeays. It is believed that Jeays built the couple's residence "Jesmond" on Wickham Terrace in 1859-60. The Lilleys probably lived there until the mid-1860s when their burgeoning family forced them to move - they ended up having thirteen children! The Lilley family moved temporarily to another Jeays-built residence, Bardon House, possibly in 1865. While they were living there, Jesmond was enlarged, presumably by Joshua Jeays, enabling the Lilley family to move back there when renovations were complete. 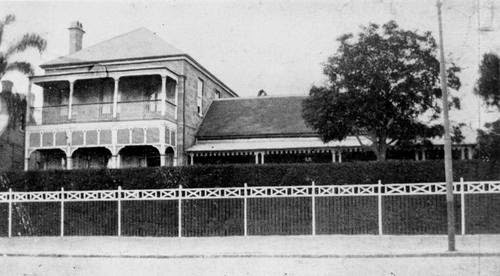 The house Jesmond remained in the hands of Charles Lilley until his death in 1897 and was subsequently purchased from his estate by the Presbyterian Church for the purpose of providing a college for students of the newly established University of Queensland at Gardens Point. It was then called Emmanuel College and here is a picture of it from 1930. When the University of Queensland moved to St Lucia post WWII, Emmanuel College moved there also. Jesmond and the surrounding property was transferred to St Andrew's War Memorial Hospital with the house becoming the administration building. The current photograph below shows the administration block of St Andrew's War Memorial Hospital. Traces of Sir Charles Lilley's house survive in the entry to the administration block which stands slightly extended from the rest of the building, and more of the original structure can be found inside. In the picture below you can see the entry - it's at the top of the stairs, between the two flagpoles. The roof above it is the same shape as the roof of the building on the left in the older photo.